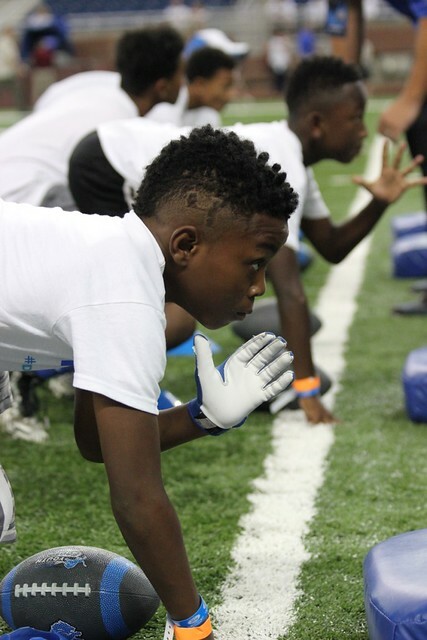 Last week 60 Michigan kids had the chance to get a firsthand look at what it’s like to play at Ford Field during an exclusive on-field clinic with Detroit Lions’ mascot Roary and members of the Lions youth football staff. Ten of the participants won their spot by practicing healthy habits in Blue Cross’ #MIKidsCan Play like a Lion Challenge. Other children were from community organizations including Detroit PAL, Boys and Girls Club of Southeast Michigan and Eagles Sports in Lansing. In addition to the on-field clinic, the kids had an opportunity to meet with Detroit Lions players and staff including Matthew Stafford, Joique Bell, Haloti Ngata, Calvin Johnson and Coach Jim Caldwell. Scroll through the album below for a look at the #MIKidsCan Play like a Lion Experience. Stay tuned to www.ahealthiermichigan.org/mikidscan for information about future contests and other chances to win fun prizes. Photo credit: A Healthier Michigan, Detroit Lions Inc.